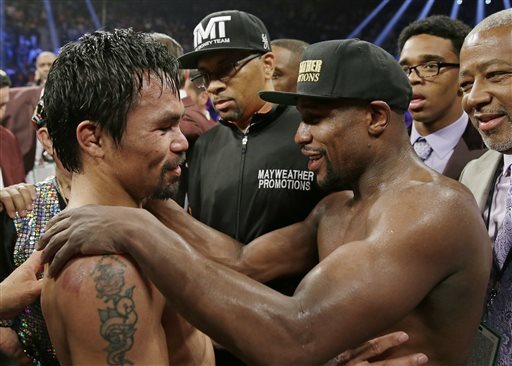 LAS VEGAS (AP) — Boxing fans across the country and their lawyers are calling the hyped-up fight between Manny Pacquiao and Floyd Mayweather Jr. a fraud and want their money back, and then some. At least 32 U.S. lawsuits seeking class-action status allege Pacquiao should have disclosed a shoulder injury to fans before the fight, which Mayweather won in a unanimous decision after 12 rounds that most fans thought didn’t live up to the hype. Fight of the century? More like fraud of the century, the lawsuits contend. “The fight was not great, not entertaining, not electrifying. It was boring, slow and lackluster,” according to a lawsuit filed in Texas alleging racketeering, a claim usually reserved for organized crime. A lawsuit filed on behalf of Flights Beer Bar near Los Angeles International Airport in California said Pacquiao and his promoter’s actions were “nothing but a cash-grab.” The bar paid $2,600 to broadcast the fight. The fighters are expected to earn more than $100 million each — Mayweather more than Pacquiao. HBO and Showtime broke records, raking in more than $400 million from 4.4 million people who paid to watch the pay-per-view broadcast. Those viewers paid up to $100 each, and the lawsuits want that money back. It isn’t as easy as showing a receipt and demanding a refund. A federal panel of judges will likely first need to decide if the lawsuits from multiple states and Puerto Rico should be consolidated into one case. From there, a judge would have to decide whether to certify them as class action or not. What’s sought in each is the same: a jury trial and at least $5 million in damages, the threshold for federal class-action lawsuits. But the defendants differ. All include Pacquiao and his promotions team but some add Mayweather and his representatives, along with HBO, Showtime and cable companies. Representatives for Pacquiao and Top Rank Promotions, HBO and Showtime had no comment on the lawsuits. Mayweather Promotions did not return multiple phone messages. In a twist, Pacquiao revealed for the first time in a post-fight press conference that he had torn his rotator cuff weeks before. The Nevada Athletic Commission denied him a pain reliever mere hours before the fight, when regulators first learned of the injury. Conspiracy theories abound as to how many people knew about the injury and when, including claims in a few of the lawsuits that Mayweather had a spy in Pacquiao’s camp and the boxer targeted Pacquiao’s right shoulder during the fight. Experts in resolving legal disputes doubt disgruntled boxing fans will be able to claim victory. “They’d have more lawsuits if they didn’t hold the fight,” said Maureen Weston, director of Pepperdine University’s entertainment, media and sports dispute-resolution project. If a fight is what fans were paying for, the boxers unquestionably delivered, she said. Just because people didn’t like the show doesn’t mean they get their money back, Weston said. Ultimately the question is: Who did Pacquiao have a legal duty to explain his injury to? Short answer: He didn’t have to tell viewers, she said. The only contract viewers had was with their cable companies, which had contracts with HBO and Showtime. It’s not the first time customers have gone to court when things didn’t go quite the way they expected in the field of entertainment. Remember Milli Vanilli? Music fans in the 1990s argued the lip-synching pop duo owed them a refund once it was revealed they weren’t actually singing. Or the bite-fight with Mike Tyson? Sports fans may have gotten an earful, but they contended they didn’t pay to see a boxing match only for it to be disqualified. So if viewers were promised a fight, and they got a 12-round fight, isn’t that enough? Lawyer Caleb Marker, who represents clients in two separate class-action suits against Pacquiao, says that’s arguable.